The first ever 100% vegan flake fighter. 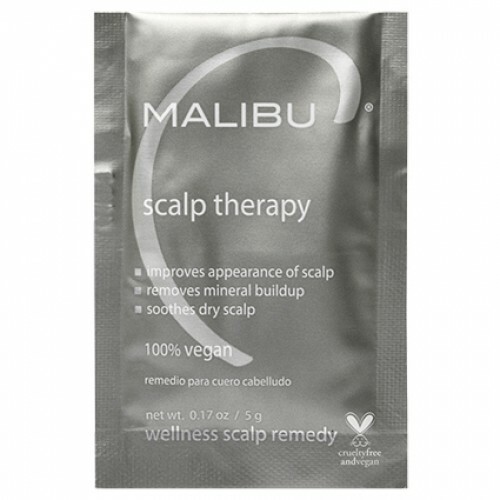 Malibu C Scalp Therapy Wellness Hair Treatment instantly sooths itching and irritation. Infused with a B and C vitamin complex, including biotin, to improve the appearance of the scalp. Removes mineral build up which can be the cause of scalp irritation. Free of preservatives, parabens, propylene glycol, DEA, gluten, fragrance, zinc pyrithione and sodium chloride. At least once a week shampoo, rinse and pour Scalp Therapy crystals across wet palm. Rub hands together, adding water to dissolve crystals. Massage thoroughly into scalp, allowing to penetrate with special attention to all affected areas. Allow to remain on scalp for 5 to 7 minutes. Shampoo, rinse thoroughly. Apply conditioner, then rinse.